``Oil and water don't mix'' says the old saw. But a variety of immiscible liquids, in the presence of a soap or some other surfactant, can self-assemble into a rich variety of regular mesophases. Characterized by their ``inter-material dividing surfaces''---where the different substances touch--- these structures also occur in microphase-separated block copolymers. The understanding of the interface is key to prediction of material properties, but at present the relationship between the curvature of the dividing surfaces and the relevant molecular and macromolecular physics is not well understood. 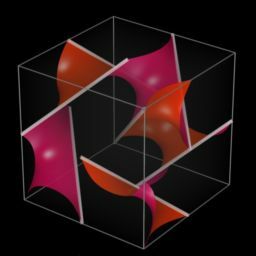 Moreover, there is only a partial theoretical understanding of the range of possible periodic surfaces that might occur as interfaces. 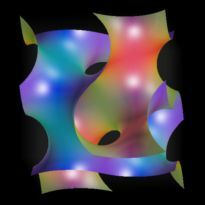 Here, differential geometry, the mathematics of curved surfaces and their generalizations, is playing an important role in the experimental physics of materials. ``Curved surfaces and chemical structures,'' a recent issue of the Philosophical Transactions of the Royal Society of London provides a good sample of current work. In one article called ``A cubic Archimedean screw,'' the physicist Veit Elser constructs a triply periodic surface with cubic symmetry. (This means that a unit translation in any one of the three coordinate directions moves the surface onto itself.) See Figure 1. The singularities of the surface are dictated by: ``the -rod packing, well known in the study of blue phases.'' Motivated by investigations in materials science, Elser constructs his surface with three other properties in mind: handedness or chirality ; Archimedean-screw-like behavior; minimality. Figure 1.a: A fundamental domain of Elser's surface, for tau = 0. Figure 1.b: Line singularities: rod packing with octahedral symmetry. Figure 1.c: A fundamental domain of Elser's surface, for tau = 30. Figure 1.d: One of the three congruent surfaces that meet at 120 degree angles along the line singularities to form Elser's surface, for tau = 30. Put a helicoid inside a vertical cylinder filled with fluid and you have an Archimedean screw, a rotation of which translates the fluid up or down. Which way the fluid is pushed is a function of which way the generating line of the helicoid turns around the axis; helicoids have handedness. And the helicoid is a minimal surface, a property whose importance for materials science will be described below. First, to understand what it means for a surface to be minimal, do the following thought-experiment. Imagine the surface sculpted from a thin rigid material. Cut out a small piece, save it, and then form a soap film over the hole. The shape of the film is determined by the boundary of the hole and the physical behavior of the soap film; it tries to minimize its area. If the soap film matches the piece you saved, and if this works everywhere you try it, the surface is minimal. A geometer would condense this by defining a minimal surface as one that is ``locally area-minimizing.'' An engineer might think of a minimal surface as a membrane interface between two gases at the same pressure, which by the Laplace-Young law will have zero mean curvature (another way to characterize minimality). Why do such surfaces occur in compound materials? Reducing surface area between two materials that are naturally repelling will reduce the total energy. It is therefore plausible that, to first order at least, the interface should be a minimal surface. Since this is happening in the same way everywhere in the substance, it is also reasonable to expect that, at a supramolecular length scale, the structure should be homogeneous, i.e. the interface should be periodic. How would you recognize a periodic, space-dividing minimal surface if you happened to run into one? The helicoid was identified as a minimal surface in 1776, but the first doubly periodic example was not discovered until the 1830's by H. Scherk and the first triply periodic example was found only some 35 years later by H. Schwarz. More examples were found around the turn of the Century, but the subject slowly receded below the mathematical horizon. In fact, periodic minimal surfaces have gone in and out of mathematical fashion for the last 150 years. The latest revival dates to the late 1960s when A. Schoen, then working for NASA and interested in strong-but-light structures, found several new triply periodic, space-dividing minimal surfaces. For many years these surfaces were better known among materials scientists than among mathematicians. Since the early 1980s, they have been again of interest to differential geometers, in part due to their importance in materials science. 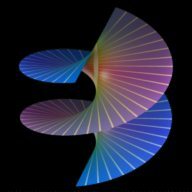 Recognizing minimal surfaces is much easier now that computer simulation and graphics are widely available. Schoen's most spectacular discovery was the the gyroid, pictured in Figure 3a below. After 30 years of obscurity, it is currently the darling of researchers who study block copolymers. 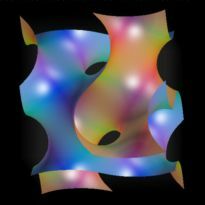 Claims have been made that this surface and its companion constant-mean-curvature surfaces are found in many materials. 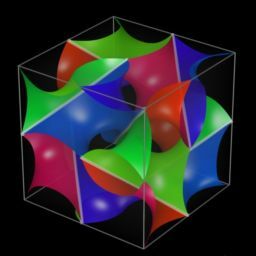 To simplify calculations, materials scientists and crystallographers have substituted for the gyroid--- and for most other triply periodic minimal surfaces---the locus of solutions to a single equation involving trigonometric functions in three space variables. For example, the solution to sin x cos y + sin y cos z + sin z cos x = 0 is, visually, amazingly close to the gyroid. (See Figure 3b.) The utility of studying such ``zero-set surfaces'' for material-science purposes is explored in detail in another article in this same issue. Among other things, by looking at level-set surfaces with zero replaced by a small value, they allow rough approximation of families of interface candididates whose mean curvature is expected to be close to constant, and which divide space into regions of unequal volume per unit cell. These functions are not found by chance; they come from choosing an appropriate lowest-order term from the Fourier series of an electrostatic potential function derived from charges whose distribution has the desired space-group symmetry, or from a symmetrization procedure using generators of the space group. But there is as yet no real explanation as to why the match is so good in some cases and not at all accurate in others. From a mathematical point of view there are other problems with this approach. For one thing, these zero-set surfaces are not minimal surfaces, yet are often treated as such in the materials science literature. Properties of minimal surfaces are claimed for them when convenient; when not convenient or when they contradict experiment, these same properties are simply ignored. Figure 3.a: The gyroid, a triply periodic, space-dividing minimal surface, discovered by A. Schoen in the late `60s. It contains no lines and has no reflective symmetries. It's space group is . Elser's surface is a zero-set surface. (Actually, it is the union of three copies of a zero-set surface. They meet along the network of lines illustrated in Figure 1b.) It is not minimal (he acknowledges it) and it is not known whether or not there is a minimal surface close to it in the sense that the gyroid is close to the zero set of the equation above. Moreover, the conversion of a rotational motion to a translation, the Archimedean-screw property, is not a property of this surface at all, but a property of a family of zero-set surfaces, considered as a deformation of the original one. 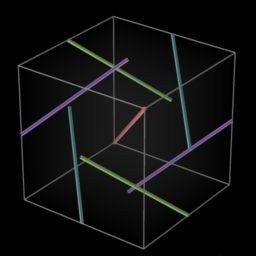 (The family of surfaces can be viewed in these MPEG animations) None of them are minimal and no two of them are congruent. They are not even locally isometric and only exhibit a weak form of handedness when taken as a family. 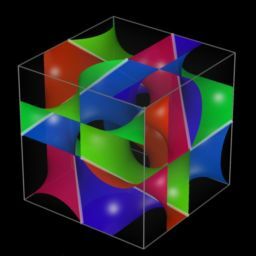 Yet it is impossible to deny that pictures of Elser's surfaces may be useful in the understanding of blue phases in liquid crystals. As a mathematician, I struggle to appreciate this while at the same time I recoil at seeing important distinctions---and sometimes basic definitions---misused or ignored. In thought-experiments and real ones, Archimedes applied mechanics, the law of the lever in particular, to discover geometric relationships. He then tried to prove them by more formal means and often he succeeded. What appears to be happening in materials science today can be viewed as an inversion of this process. Namely, physical structures are being discovered by the sometimes very loose application of differential geometry. Their validation depends on whether these structures organize and predict observable phenomena, not on whether or not the theory was used correctly from a mathematical standpoint. Materials science and mathematics may be immiscible, but with computer simulations and computer graphics as surfactant, there are interacting in unusual and productive ways.